The Beacon Park and restaurant building, situated along Grand River Avenue, welcomes visitors into the center of downtown Detroit. 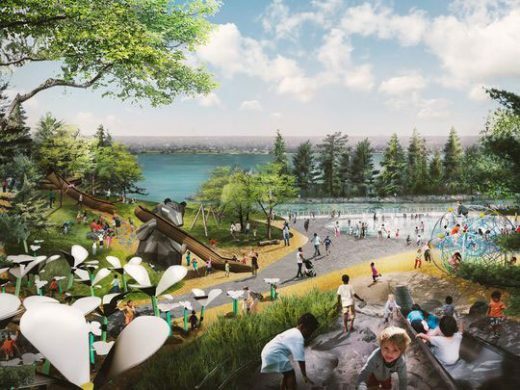 The Detroit Riverfront Conservancy has selected Michael Van Valkenburgh and David Adjaye of Adjaye/Associates as the winners of a $50-million competition to redesign a 22-acre park along the Detroit River. The proposal’s centerpiece a beach within a cove protected by a jetty that juts diagonally into the waterway. The site is part of the Conservancy’s plan for a five and a half-mile stretch of waterfront west of Belle Isle to the Ambassador Bridge. 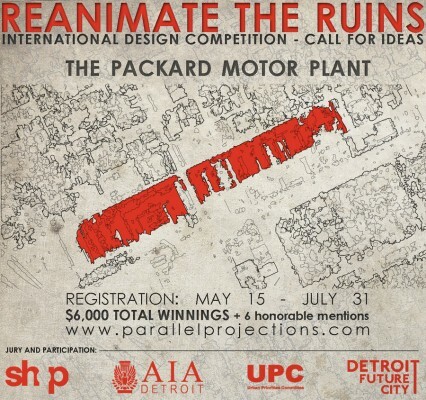 The land contains former factories and rail yards abandoned as Detroit collapsed into bankruptcy in 2013. 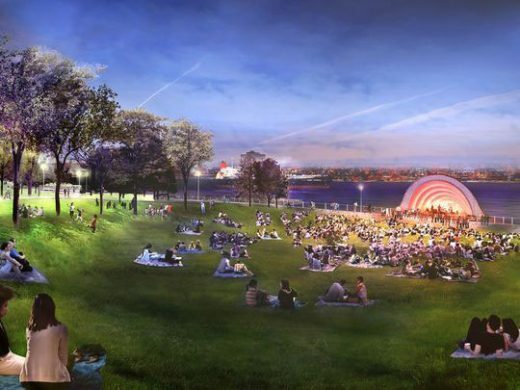 The Detroit Riverfront Conservancy, which builds and manages the RiverWalk, announced Tuesday April 10th, 2018 that it has selected Brooklyn-based Michael Van Valkenburgh Associates to design the 22-acre west riverfront park in Detroit. The park is estimated to cost $50 million, with the money to be raised through donations, and it should be finished in four to five years. Skidmore, Owings & Merrill (SOM) has been working with the Detroit Riverfront Conservancy for the last decade on a plan for the East Riverfront District, and 80 percent of that 3-and-a-half mile framework is complete. The West Riverfront Park will supplement it. In 2017 the Conservancy selected four design teams of architects and landscape architects as finalists, to present proposals in a public forum and exhibition—part of a long process in which the local community participated. 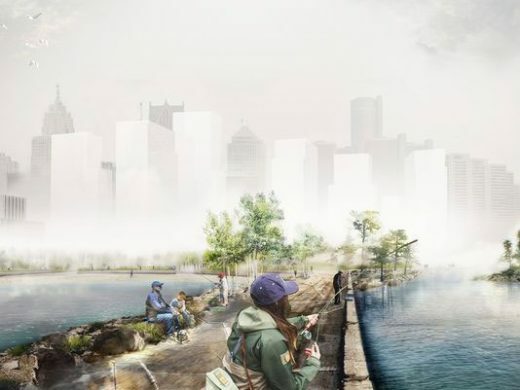 Each team included standard water-related features for revived waterfront sites—boardwalks, piers, docks, beaches, as well as kayaking and fishing facilities. All emphasized the need to relate the river and the city to one another. 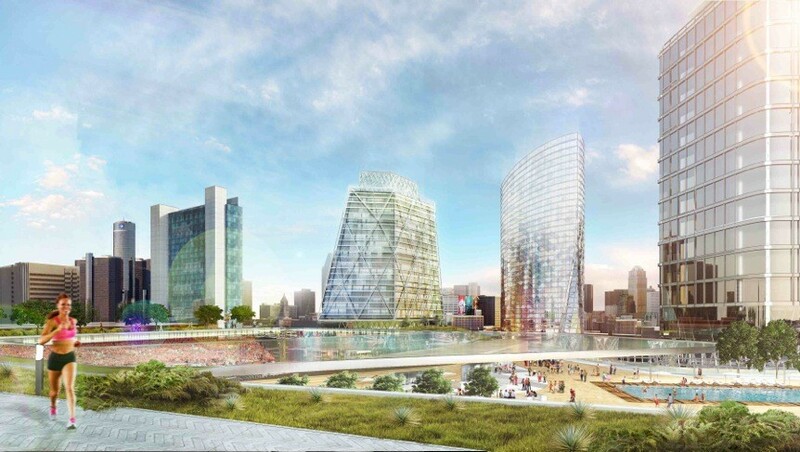 Located at the center of the spokes that connect greater Detroit, this new development will make an impact far beyond its surrounding context, it will become a destination, an icon for the future development of Detroit. The new development will combine downtown Detroit’s first high-rise office tower in a generation with over 480 residential units. The development, designed by ROSSETTI and proposed by Rock Ventures and Platinum Equity, will mark the main entry point to downtown Detroit, forming a welcoming gateway to the city at the intersection of I-375 and Gratiot. A 350 page master plan is guiding the new Detroit. The shape? Unclear but promising. Detroit, once the fourth largest city in America and Michigan’s primary Metropolis, has recently filed the largest municipal bankruptcy in the history of the United States. Among the many reasons for Detroit’s decline, two stand out: an undiversified economic model, reliant on the production and sale of automobiles, and an unprecedented degree of sprawl. Currently more than 77% of jobs in the metropolitan area reside more than ten miles from the city center, making Detroit the most job sprawled city in the United States, stretching essential services beyond capacity. Detroit’s deterioration is just as much about urban decline as it is about industrial decline. There are many great buildings in Detroit. Lafayette Park by Mies van der Rohe, an amazing urban redevelopment, the first of it’s kind in the nation. Also the Guardian building, Fisher Theater, One Detroit Center, a Philip Johnson design, One Woodward Avenue, a Yamasaki Design. Eero Saarinen and Albert Kahn had an influence on Detroit, probably the two that influenced the city’s architecture the most. Located at Michigan and Cass Avenues, the Rosa Parks Transit Center is a 25,000-square-foot indoor facility with over two acres of exterior transit access. 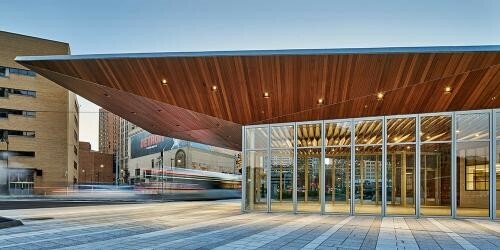 It enables customers to make connections to 21 DDOT bus routes, the SMART suburban bus system, Transit Windsor for international connections, and taxi access in a single downtown transportation hub. It also provides pedestrian connectivity to the Detroit People Mover stations at Michigan and Times Square, and was planned to eventually connect to the city’s future light rail transit system. Detroit is located in the Midwest portion of the United States and is part of a larger band of cities known as the Rust Belt which have gone through a process of decline over the past decades.